In the 1950s, researchers at Johns Hopkins conducted some very troubling experiments. They caught wild rats and squeezed them in their hands until they stopped struggling, teaching them that nothing they did would let them escape the crushing grip of their human captors. Then they dropped the rats in a bucket of water and watched them swim. Now, wild rats are superb swimmers. 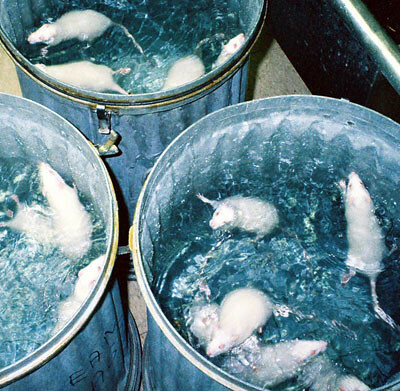 On average, rats that had not received the squeeze treatment lasted around 60 hours in the bucket before they gave up from exhaustion and allowed themselves to drown. One unsqueezed rat swam for 81 hours. A later rats-in-bucket experiment (not quite so brutal). Photo credit: MBK (Marjie) (Flickr). The average squeezed rat sank after 30 minutes. In my previous posts about tech debt, I focused on how we can help organizations remember their debts, and on understanding how tech debts are funded and paid back. They’re not wrong to worry. However, today I’d like to put on my executive hat and discuss tech debt from a perspective that code jockeys sometimes miss, because blindness is not just an executive disease. When you hear the word “leverage” in business circles, people are talking about debt: a “highly-leveraged” firm is one financing large portions of its strategy through debt; “leveraged buyouts” are transactions where the buyers borrow vast sums of money from a risk-taking lender to take a company private. Technogeeks (like me): business people are not dumb. Why did they settle on this metaphor of debt as leverage? The answer is that debt can allow a company to concentrate enough capital in a short enough timeframe to make high-impact strategic moves that would otherwise be impossible. It’s an enabler and multiplier. 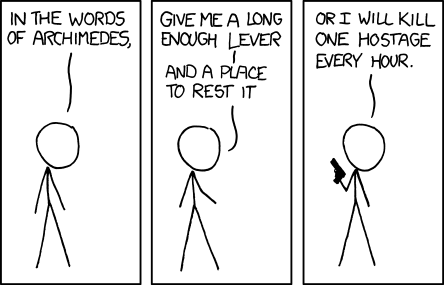 Another take on leverage. Image credit: xkcd.